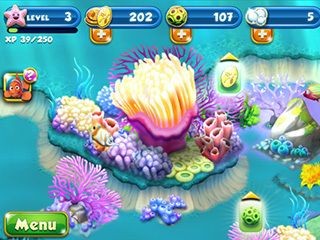 From the hit Finding Nemo franchise comes Nemo’s Reef, a unique reef building game that gets you right into the excitement of Disney’s Nemo universe. Based on the 2003 animated film, and the following shorts, films, and products, this cute little game lives up to Disney’s high standards. If you love Pixar, Disney, and clownfish with disproportionate fins, then you’ll love this video game. Get your fins wet in this exciting under-the-sea construction game! 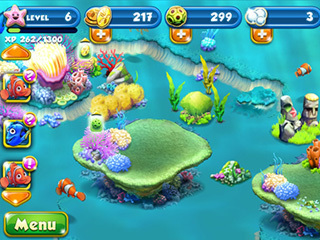 Play with your favorite characters, including Nemo, Dory, Gill, and more as you build the coolest reef in your class. There are over 50 different kinds of fish that you can collect, each of which have a cute Pixaresque cartoon feel to them. The whole game has graphics that meet or even excel the technology that was available twelve years ago when the first movie came out. If you enjoy other empire games, such as Farmville or Sim City, then you know the basic idea of what’s happening. You build and build, only this time you’re in a Nemo setting. 11 out of 10 on the cute scale! This game is easy to get into for those who are familiar with Google Play. If not, then this game would be a great introduction to Google Play for you. This game will let you link to social networking sites to get your friends involved. There are in-game purchases available for about $1-$5. With Disney, you know that you’re getting good quality for your money. Lots of personalization takes place in this kind of game, so it’s a real opportunity to express yourself in a unique way. Download ASAP! This is Nemo's Reef review. Download this game here.